JobPro’s FileMaker CRM is a structured means of managing relations with your customers, vendors and contacts. Our CRM is broken out into company, contacts, document, jobs, tasks, time logs and communication modules. From either company or contact module it is possible to get an overview of all activities carried out from within your business. Activities such as history of sales calls, discussions, meetings, internal notes, outbound emails are examples of just some of the information that can be captured. Activities can be seen from many contexts in the system, for example, you can look at communications you have had with a customer from the context of an inquiry or from the context of the overall customer level. 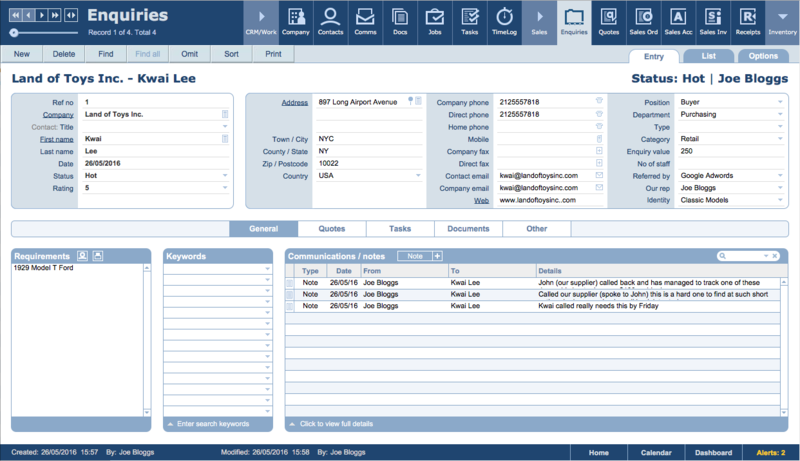 Our CRM module is incredibly flexible. The CRM element of JobPro represents the hub from which all other tasks can be carried out within the system. See our screen shots below. Centralised communications module which is also integrated throughout the system. Send emails, letters, SMS direct from within JobPro Central. 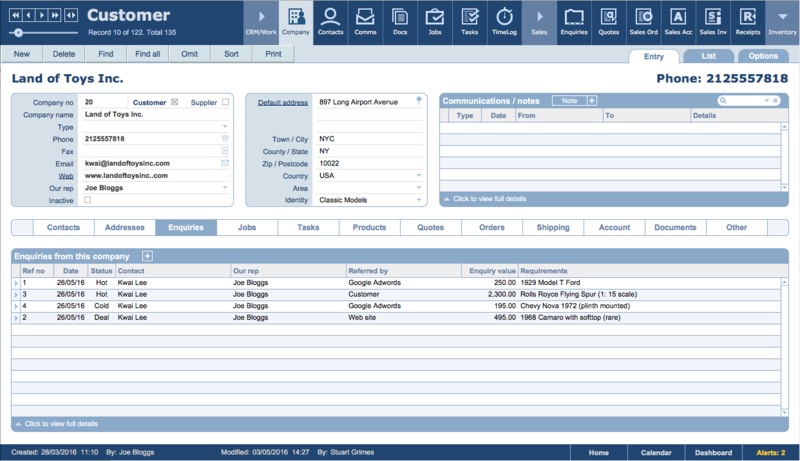 Make notes of any contact with customers / suppliers that can also be made context dependant i.e. as part of an enquiry, job, task etc. Create multiple ‘finds’ on your database to create a found set of data to carry out a mail shot from customisable templates. View your found set in list or form view. In the screen shot below we are in the companies module and we have selected the “Inquiries” tab for this customer. We can see a history of all inquiries from this customer along with some other relevant details. We can select this enquiry by clicking on the arrow to the left of the inquiry. In the screen shot below we have selected the first inquiry shown in the previous screenshot. Here we can see the inquiry linked to our customer. The communications portal shows us a history of notes we have made in relation to this inquiry. Other communication types that are handled by this portal are Email (outbound), Letter, Fax, SMS and Message.